Subcellular distribution of proteins predicted to be involved in invasion. 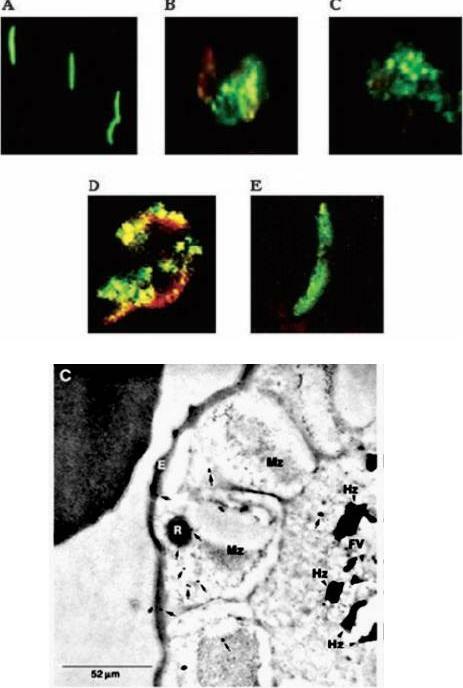 All proteins were localized in schizonts (s) and free merozoites (m) using GFP-fusion proteins and grouped according to their predominant GFP localization. Apical. Nuclei were stained with DAPI (blue).Hu G, Cabrera A, Kono M, Mok S, Chaal BK, Haase S, Engelberg K, Cheemadan S, Spielmann T, Preiser PR, Gilberger TW, Bozdech Z. Transcriptional profiling of growth perturbations of the human malaria parasite Plasmodium falciparum. Nat Biotechnol. 2010 28(1):91-8. 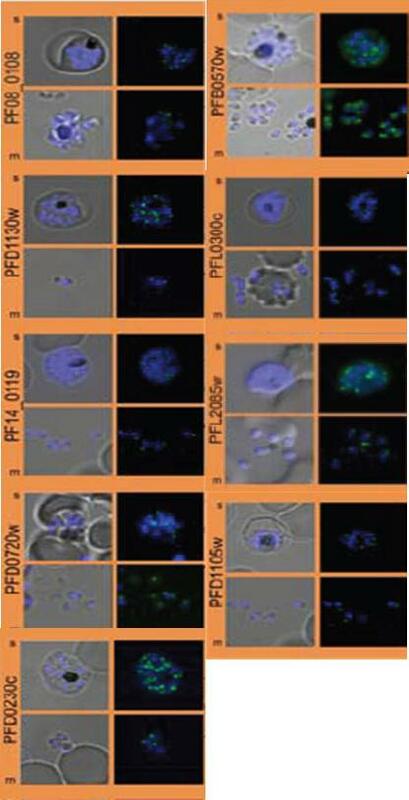 Upper panel: Immunofluorescence assay using anti-PfSPATR sera from mice immunized with the recombinant protein to detect PfSPATR protein expression in different stages of P. falciparum. A, sporozoite (1:6400). B, trophozoite (1:640). C, asexual erythrocytic stage schizont (1:640). D, merozoites escaping from a late stage schizont (1:640). E, gametocyte (1:640). Dilutions of antisera used are in parentheses.Lowest figure: Localization of PfSPATR in P. falciparum by immunoelectron microscopy. Cross-section of an infected erythrocyte containing a schizont. R, rhoptry; Mz, merozoites; FV, food vacuole; Hz, hemozoin pigments; E, erythrocyte membrane. The protein was expressed around the rhoptries in the asexual erythrocytic stage.Chattopadhyay R, Rathore D, Fujioka H, Kumar S, de la Vega P, Haynes D, Moch K, Fryauff D, Wang R, Carucci DJ, Hoffman SL. PfSPATR, a Plasmodium falciparum protein containing an altered thrombospondin type I repeat domain is expressed at several stages of the parasite life cycle and is the target of inhibitory antibodies. J Biol Chem. 2003 278:25977-81.